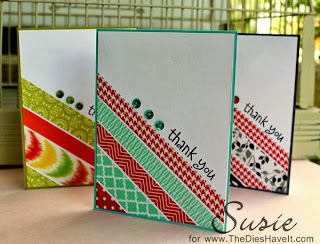 Have you ever thought, 'I wish I had some thank you cards made already'? Well, if you choose a simple design, you can make bunches of them all at once and then you WILL have them when you need them. That is what I did. 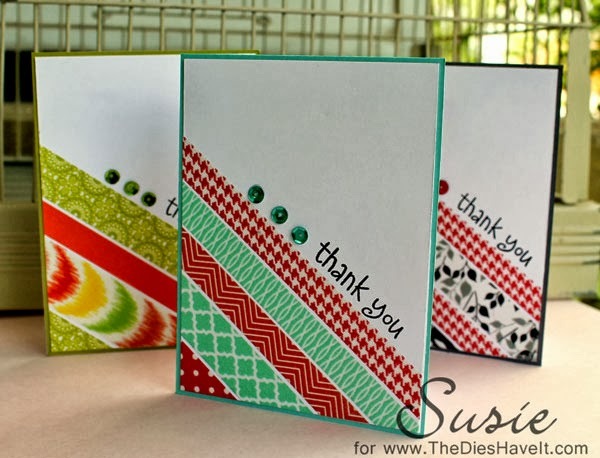 I used different Washi tapes to make my design and then stamped my sentiment assembly line style once my cards were all complete. I added three sequins to each card and then tucked them away for future use. This is a wonderful gift idea too. Just tie some twine around a set of four or six and you have a gift that anyone would love to receive. Easy peasy for a Monday!! I would love to know if you ever use this technique. It's a winner!